Each year, an unfortunately large number of senior citizens in nursing homes experience abuse and neglect at the hands of caregivers. Statistics even suggest that the number of cases involving abuse in nursing homes is increasing. This abuse occurs even though Congress has enacted federal regulations regarding nursing homes. These regulations state that individuals who live in nursing homes have the right to remain free from mental, physical, sexual, or verbal abuse in any form. If you or a loved one resides in a nursing home, it is helpful to understand some of the most common ways in which nursing home abuse occurs. 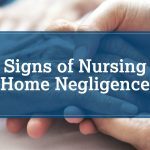 If you believe that you have been the victim of nursing home neglect, do not hesitate to contact an experienced attorney who can help navigate the various complicated laws that apply to nursing homes. While it is always a good idea to immediately contact an attorney if nursing home abuse is believed to have occurred, there are some steps that can be taken in the interim to reduce the damaging effect of abuse at these locations. This advice is divided between prevention tips for older individuals and their families. Keep your will up to date and make sure that it accurately reflects your intentions. Make sure to keep regular appointments. Remain in contact with life outside of the nursing home. Use direct deposit for government benefits. There are also some steps that individuals can take to prevent nursing home neglect that is believed to be occurring among family members. Discuss various estate planning options and tools with loved ones. If you or a loved one is overwhelmed with caregiving, research other options for care. Keep close ties with loved ones who reside in nursing homes. Share caregiving responsibilities to prevent exhaustion. Speak about health care decisions and issues with loved ones. Use community resources as necessary. If you have experienced any form of abuse or neglect at a nursing home, retain the assistance of skilled legal counsel. Our law firm has helped many victims of nursing home neglect receive the compensation they deserve. Contact The Ferrara Law today so that we can address any questions that you might have about nursing home neglect.